Prepare to point and click your way through the rain-slick, neon-lit streets of Europolis. Red Thread Games has found success Kickstarting Dreamfall Chapters, the long-awaited sequel to the hit adventure game Dreamfall: The Longest Journey. Having already surpassed their original $850,000 goal and two stretch goals after that, the developers have released some information about the game's setting to drum up support as they approach the million dollar mark. While previously detailed locations have been high fantasy cities locales full of magic, the newly announced city of Europolis takes a hard left into the grim realm of cyberpunk. The story of The Longest Journey is set across two parallel worlds: Arcadia, a place of magic and fantasy, and Stark, a world of science and order. Europolis, as you can probably guess, is located in the latter. A vast city stretching over the remains of Poland, Germany, the Czech Republic, Belgium, and the Netherlands, Europolis is a dark city full of shady characters. "Europolis is not just the dark heart of Europe," explains the game's Kickstarter page, "it is the filthy bowels and bloodied entrails of Europe." The city will be, to some extent, free-roaming and fully explorable (though you likely won't need to point-and-click across the entirety of central Europe). Europolis had originally been planned as a visitable location in Dreamfall: The Longest Journey, but didn't make the final cut. Now, it joins locations like the fantasy city of Marcuria and the magical forests of the Northlands as key environments in Dreamfall Chapters. You can get an early peek at the gritty streets of Europolis in Red Thread Games' reveal trailer, running on an early prototype of the game engine. 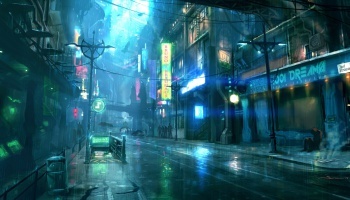 It's certifiably cyberpunk, complete with shadowy, umbrella-wielding people drudging through the neon-tinted rain. The seedy streets should act as, well, a stark contrast to the markedly brighter environments of Arcadia. It's not certain what kind of business Dreamfall Chapters' dual protagonists will have in Europolis, but it's safe to assume it won't be pleasant. Studio head Ragnar TÃ¸rnquist describes The Longest Journey's alternate Europe as "a poverty-stricken and thoroughly corrupted wasteland," so it's certainly ripe with cyberpunk tropes already. Fans will have plenty of time to speculate, as the game's Kickstarter will keep running until March 10 with more information sure to come.